Episcopalians are descendants of, and partners with, the Church of England. The Episcopal Church was formed in the early 1500s after King Henry VII and Parliament said they no longer wanted the Pope ruling over England’s Churches or taking its money. Our way of “being” the church is modeled after Queen Elizabeth’s leadership style. Her leadership embodied a “Middle Way” of compromise between both Catholic and Protestant traditions and beliefs. During a time of immense violence and division in England over the question of religion, Elizabeth gave a lot of latitude to individual conscience regarding beliefs. This does not mean Episcopalians are “indecisive” Christians regarding our beliefs. Rather we value the mystery of what God is doing in the world and we view compromise as a way of living out Christian Charity. We believe that the teachings of Jesus Christ are the way to true life. They model a way that God has called us all to live. To follow Jesus is to live a life filled with inclusive relationships, unconditional love and service to those in need. To live like this is life giving, filled with joy, and brings incomprehensible peace during the most tumultuous seasons of life. To live any other way just feels silly. Our Worship has a focal point and this is the Eucharist or “Great Thanksgiving.” It is a time when we come to the altar to break bread together – regardless of race, citizenship, age, marital status, income, or gender preference. We realize that at the foot of the cross, the ground is level and all are beloved by God. Everyone can share in this gift from God, receiving God’s presence so that they are empowered to go out into a hurting world and bring forth God’s transforming love. The Book of Common Prayer (BCP) is our center. This book gives us our framework for worship and is filled with poetry, prose and beautiful language that pulls us into a deeper relationship with God. Our BCP has been used by many outside the Anglican Communion in over 50 different countries and has been produced in 150 different languages. Our BCP is so good that it is the most frequently cited book in the “Oxford Dictionary of Quotations,” after the Bible. Yes, we love you. Every. Single. One. As Episcopalians, we take the first and second commandments to heart (See Matt.22 Verses 34 to 40). First, love God. Second, love your neighbor as yourself. And yes, that means ALL of our neighbors. Not just the ones we like. Or just those that look like us, or share the same sexual preferences, or that run in the same social circle as us. It means that if we truly love and honor God, we must love those who might not seem so lovable to us at first. It's not easy all the time. It's much easier to love the neighbor who takes in your garbage cans and retrieves your mail when you are on vacation, than the neighbor who shoots off fireworks until 3 in the morning and who doesn't mow their lawn. 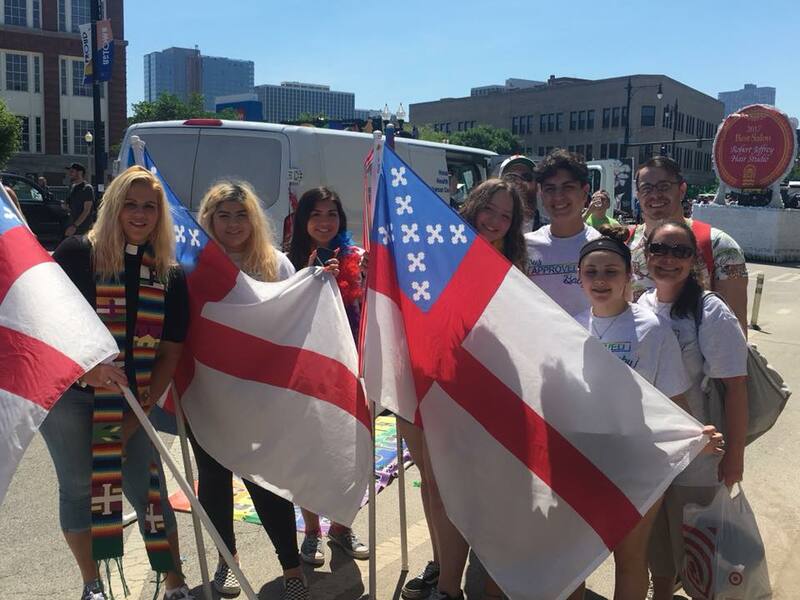 Being an Episcopalian, however, means that we try to spread the message of God's love with each other and whomever we encounter in our lives. And yes, that includes the Sox fan across the street. 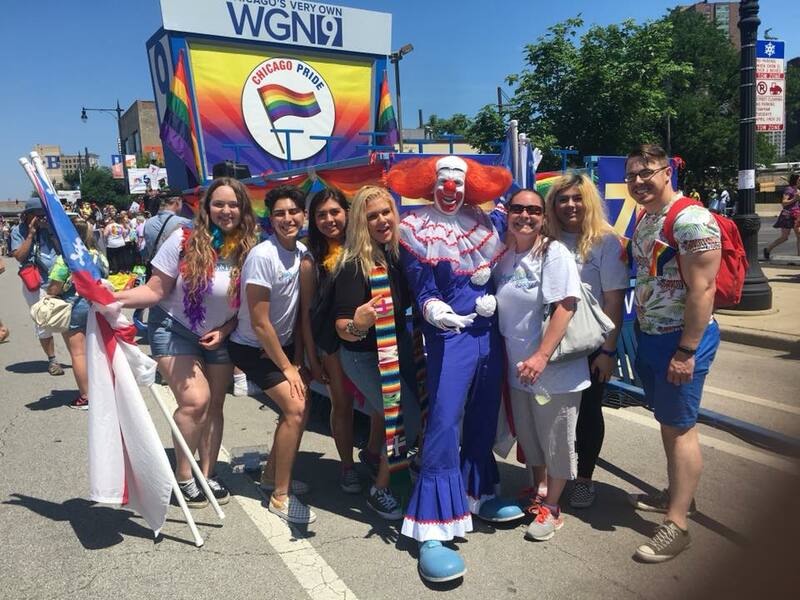 Calvary Teens at Chicago's Pride Parade living out Christ's teaching with their unconditional love for others.